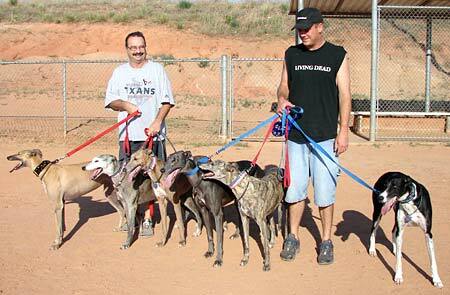 We got hooked on greyhounds when we met our son Kyle's first greyhound, Argos. He chipped one month later with another, Mia (both from a kill shelter). Then we adopted Emma and chipped one month later with Oprah (both from GALT) . Then Kyle adopted GALT's Nice Guy and soon after, we adopted a three year old named Valentine (from a kill shelter). All this in 15 months!!! Family get-togethers are "greyt" fun with all six hounds and they all get along very well! !